Only 5 ingredients in this Potato Salad with Bacon recipe. All of your favorite potato salad add ins coated in a delicious ranch dressing that will be your GO TO BBQ side dish recipe! Potato Salad with Bacon is a must in my world. Honestly, I’d eat just potatoes and bacon all by itself but if I showed up at a BBQ with just that Im sure I’d get some strange looks. 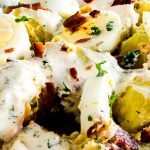 This recipe for Bacon Ranch Potato Salad has all of your favorite things in it, but is super easy to put together! 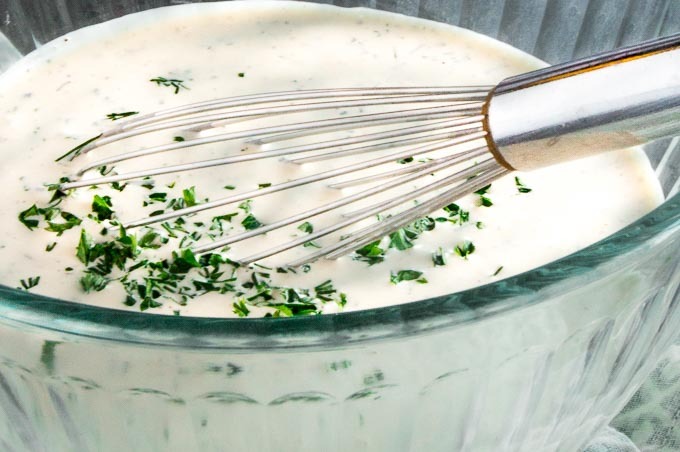 Last week I shared with you the recipe for Easy Homemade Ranch Dressing and I’d made so much of it for photographing I was looking for new ways to use it. We had a BBQ to go to and it seemed like the perfect thing to try. You dont need a million ingredients so it comes together quickly. What kind of potatoes work best for Potato Salad? Ideally you want to use a waxy potato (a potato that doesn’t have a lot of starch in it.). 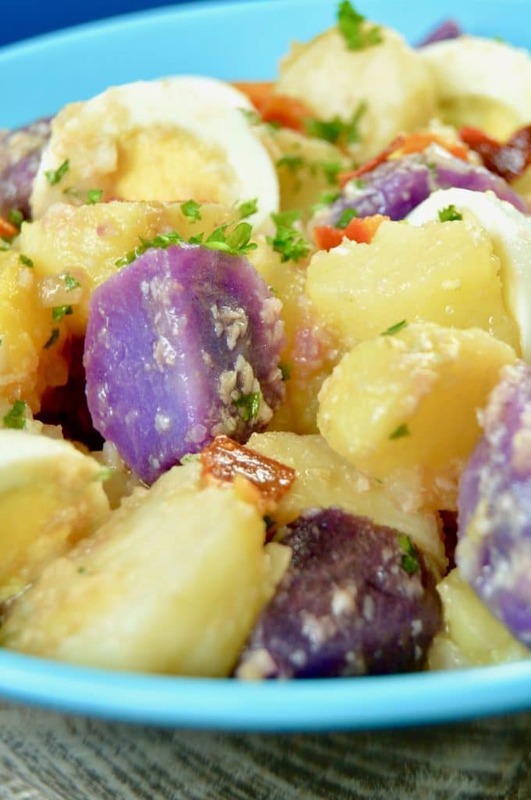 Yukon Gold, New Potatoes and Fingerlings are examples of potatoes that work well in a potato salad. They hold up after boiling keeping their shape and they will still absorb the dressing you add to them when mixing up the salad. You can use russets (which are a starchy potato) but you have to be VERY present when boiling them so they don’t turn into mashed potatoes before you even start mixing them into your salad. I would also suggest cutting them into very large pieces if you use a russet potato so that if they do start to fall apart you will still have a chunk left instead of just bits. Do you need to peel the potatoes for Potato Salad? Some people think the skin is a little too bitter when biting into it. Sometimes I like the color of the skin as a contrast and I don’t mind the skin at all on Yukon gold or fingerling potatoes. It also depends on what potato you are using. If I only have russet potatoes, I will always peel those. They tend to be larger and I want to cut them into chunks before I boil them. 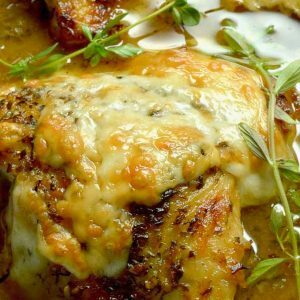 In this recipe I used Yukon Gold Potatoes and found I liked the texture of the final potatoes better when I boiled them with the skin on whole then peeled them right after draining the water when they were done. Use thick cut bacon. It will hold up better when you stir up the potato salad. 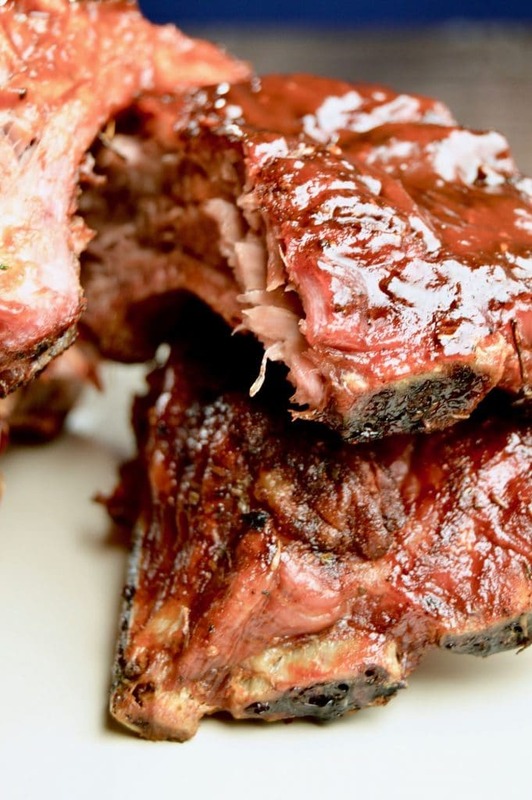 Make the bacon in the oven using a roasting pan with holes to drain away the fat. 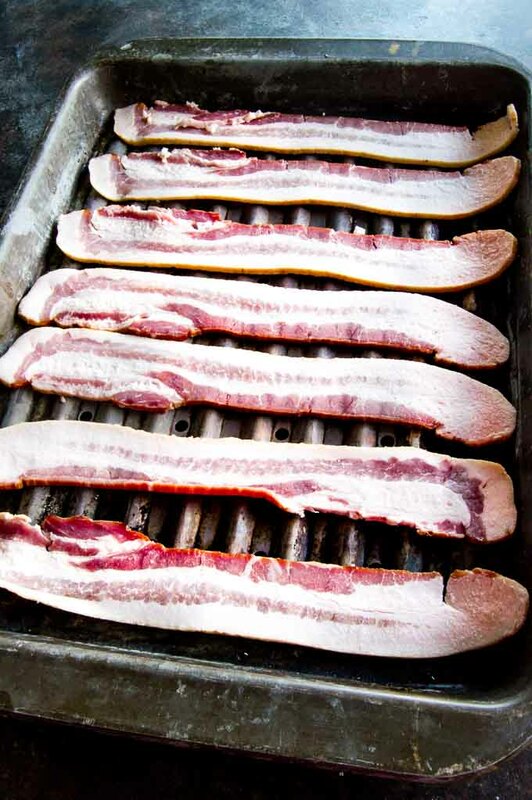 (Or alternatively use a wire rack over the top of a pan to allow the fat to drip away from the bacon. This allows for two things: Your bacon will be crispier and it will stay flat and not break up when cooking. Even though you will be cutting up the bacon, you will be able to cut it into larger chunks so that each bite of Bacon Ranch Potato Salad has a big flavorful piece of bacon in it. On the roasting pan allow enough room between bacon slices that some of the holes for rendered fat to drain to the bottom. When boiling the potatoes, boil them whole and unpeeled. Try to get potatoes of similar sizes so they cook in the same amount of time. 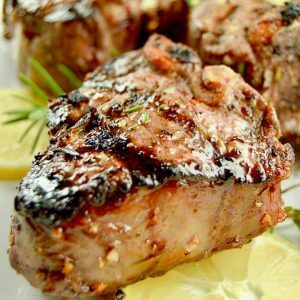 You can test the doneness by using a skewer or a toothpick. If the potato slides off easily it is done. Toss the potatoes in the dressing right after you’ve peeled and cut them. The warm potatoes will absorb the dressing easily when warm. Do you have to use a homemade Ranch Dressing for Bacon Ranch Potato Salad? I highly recommend using my homemade buttermilk ranch dressing to make this Bacon Ranch Potato Salad, but if you are in a time crunch by all means use your favorite ranch dressing as a substitute. If you buy a thicker dressing you may want to thin it a little with a little milk but if it easily pours you will be fine with it as it is! 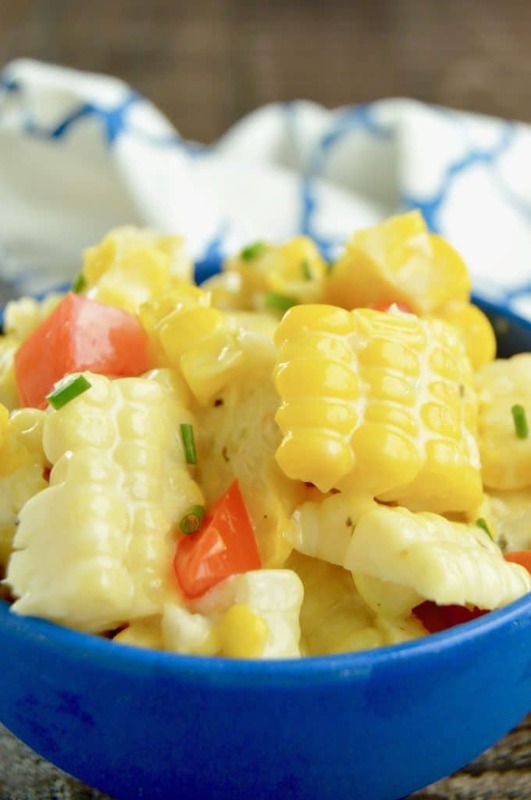 This Potato Salad goes great with any grilling you may be doing! 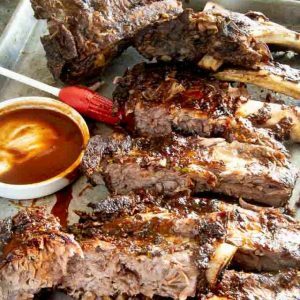 It pairs well with these No- Fail grilled Lamb Chops or these Fall of the bone tender BBQ ribs or this Grilled Ribeye with Chimichurri Sauce. 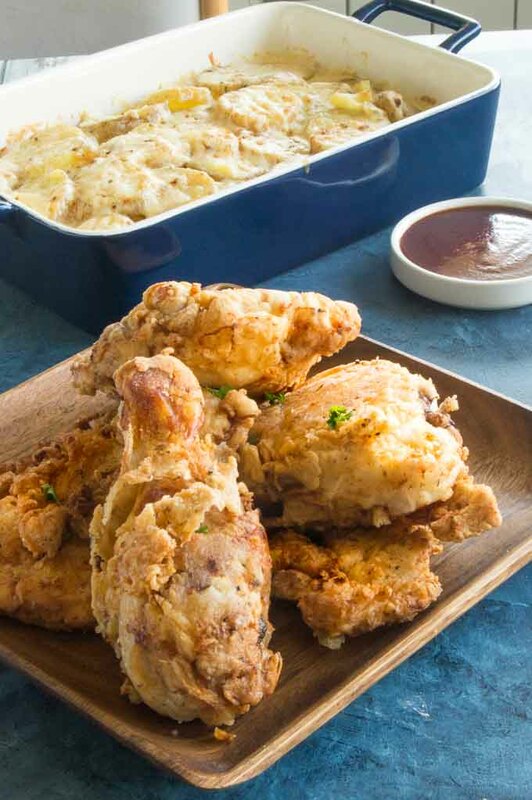 It also holds up well for a picnic with this Crispy Southern Fried Chicken. 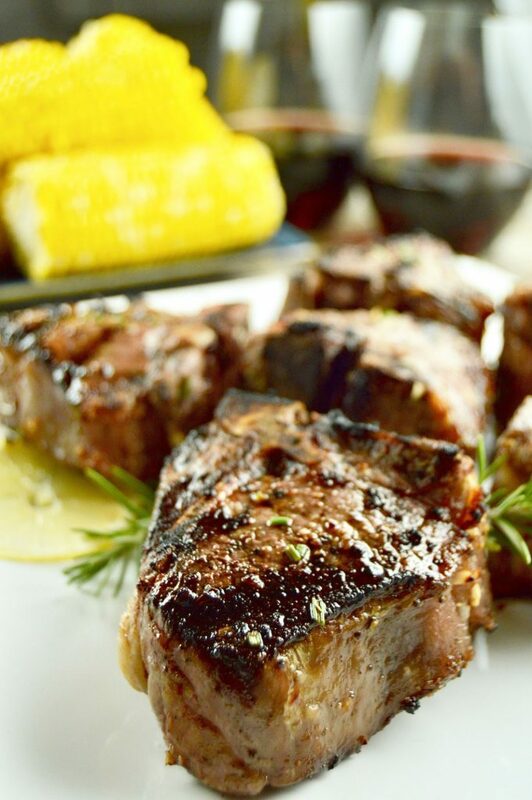 Other Side Dishes that work great for any BBQ’s this summer! 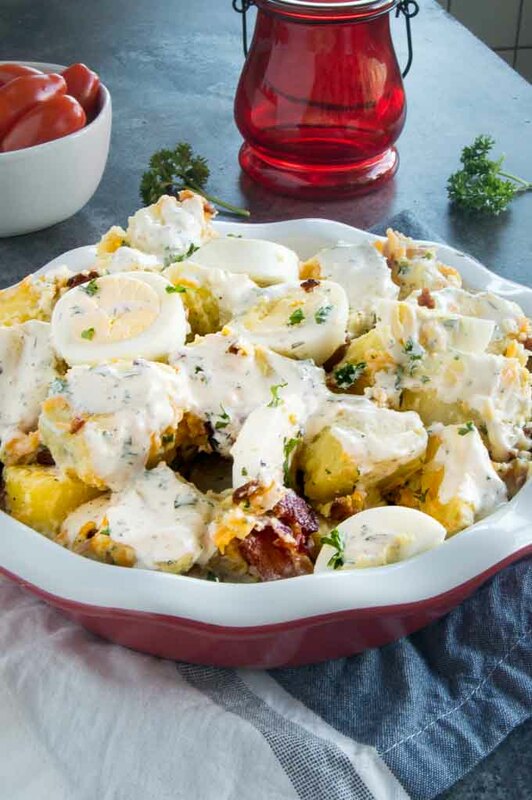 Only 5 ingredients in this Potato Salad with Bacon recipe. All of your favorite potato salad add ins coated in a delicious ranch dressing that will be your BBQ side dish go to recipe! Cook bacon for 12-15 minutes until browned and crispy. 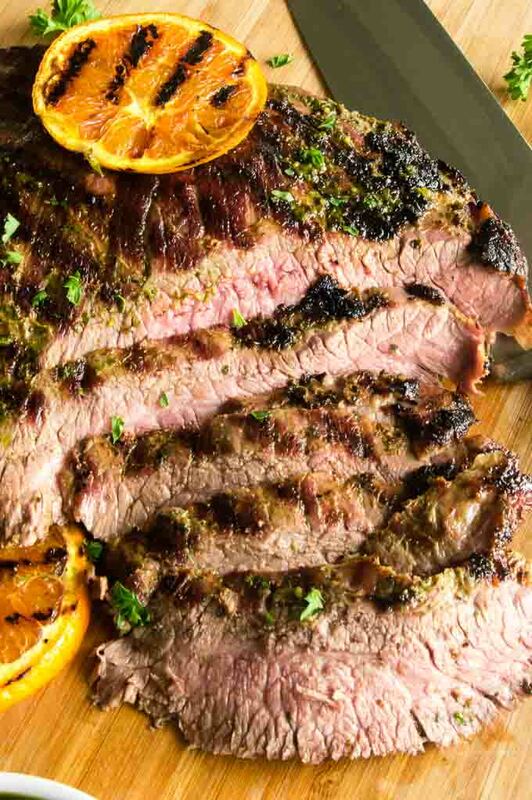 Remove from oven and pat with dry paper towel to remove any extra fat. Cut or crumble bacon into bite sized pieces and set aside until it is time to add it to the potato salad. At the same time the bacon is cooking boil the potatoes. Fill a stock pot with water and place the unpeeled Yukon Gold potatoes into the water. Place on the stovetop and bring to a boil. Depending on the size of the potato it will take 20-30 minutes to fully cook the potatoes. To test the potatoes doneness, use a long skewer or toothpick and insert in into the center of the potato. If it slides off easily the potatoes are done. Larger potatoes will take a little longer just remove the potatoes as each one is done if you have potatoes of different sizes. 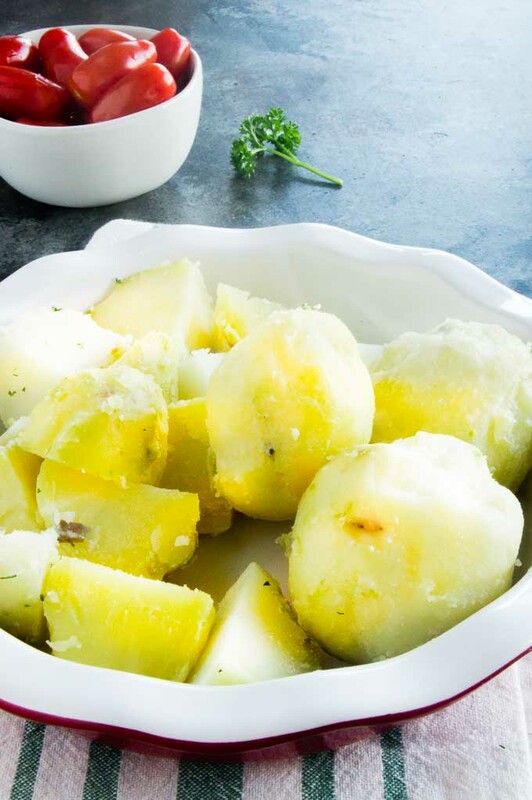 Drain the potatoes when they are all done and let sit for 5 minutes then use your finger to puncture the potato and tear a small piece of skin away then use a paper towel to gently peel away the skin from each potato. Once they are all peeled cut into large bite-sized chunks. 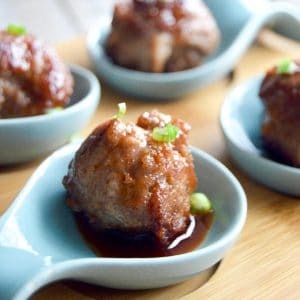 Place chunks of potatoes into a bowl. Pour 3/4 cup of dressing over the top and stir gently. Let sit and absorb for 5 minutes. Then add bacon pieces, shredded cheese and stir to combine. Place bowl in fridge in and allow to chill for at least 1 hour. Then remove from fridge. Cut hardboiled eggs in half and add to potato salad along with the last 1/4 cup of ranch dressing. Serve immediately . Why have I never thought to add bacon to potato salad?! I love all things bacon. I can’t wait to try this! Oh wow! You had me at bacon ranch! Love the homemade buttermilk ranch too. Great potato salad! I love everything ab out this salad! The flavors pair so well together – I mean who doesn’t love ranch and bacon?!!! It is simple and easy to make which is a huge plus. Really this is the perfect side dish for grilled and roasted meats – although I would be happy just to eat this salad by itself! A real winner! !